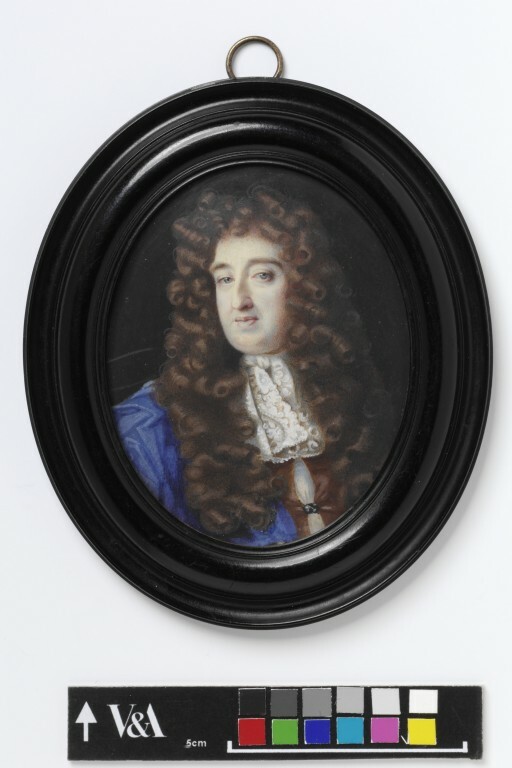 This miniature is one of a group of five portraits of members of the North family. 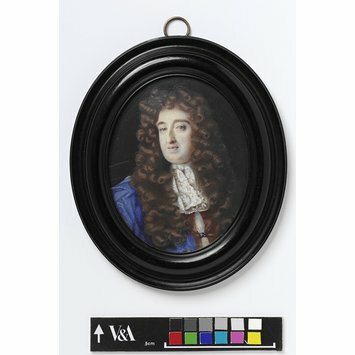 In his Seventeenth-century English Miniatures in the Collection of the Victoria & Albert Museum (1997), John Murdoch notes that the miniatures were probably painted by Edmund Ashfield (worked 1669-90). He thought this because of the signature ‘E.A’ that is found at the lower centre right on another miniature from this group. This is of Charles North, 5th Baron North de Kirtling (catalogue number 131 in Murdoch’s book; Museum number P.42-1987). Edmund Ashfield was a painter in oil and ‘crayon’ (what is called today ‘pastel’), but it was long thought that he had also painted miniatures. This group apparently supports this belief. Portrait of a man, half-length, to front and wearing a long wig and patterned neckcloth. Features hatched and stippled in brown and sanguine, modelled with blue, grey and touches of white, especially in the eyes, and some dark gum in the nostrils, on a warm carnation ground; the hair in brown wash, worked over in darker colour with the lights in ochre and grey; cloak in blue washes, shaded with darker colour and highlights in white; shirt bare vellum, shaded in grey and blue; ruff a brown wash, modelled in thick white and shaded with grey and brown; background a pale brown wash, painted over almost transparently in dark brown; on vellum put down on a leaf from a table-book. Frame: An oval frame, turned ebony of bolection moulding with additional grooves at the outer and inner edges; the inner ring possibly made separately; the convex glass set in a rebate; a plain brass ring for the hanger, with traces of original gilding, held by a pin driven through the wood at the top. A fruitwood backboard inscribed in graphite: Charles Lord North / Lord Grey. Provenance: Until 1690, Charles, 5th Baron North de Kirtling; until 1734, William, 6th Baron; his wife, Maria Margareta (born ‘de jonge van Ellemete’). who married secondly in 1735 Patrick Murray, 5th Lord Elibank; his illegitimate son Patrick Murray of Simprim, Forfarshire (d.c.1854); his daughter Maria Margaretta (d.1873) who married in 1842 James, Baron Talbot de Malahide; her eldest daughter Susan-Ann, who married in 1864 Cecil St John Ives, subsequently Major-General; their second daughter Marion who married her third husband in 1923, Godfrey Waiter, 2nd Baron Phillimore; she died in 1950; the miniatures sold to the Museum by private treaty with two of her heirs, 1987. Portrait miniature of Charles North, 5th Baron North de Kirtling and Baron Grey de Rolleston, watercolour on vellum by Edmund Ashfield, 1670-1680. Emma Rutherford and Bendor Grosvenor, Secret Faces London: Philip Mould Ltd, 2008. John Murdoch, Seventeenth-century English Miniatures in the Collection of the Victoria & Albert Museum, London: The Stationery Office in association with the Victoria & Albert Museum, 1997.